Doug Hatch is one of DENC’s most central EV Enthusiast Volunteers. The EV Enthusiasts are a group of EV owners who have teamed up with DENC to educate Northern Colorado about the benefits of driving electric. Doug has demonstrated his enthusiasm for EVs in countless ways—installing charging in his home, hosting an EV Ride and Drive in his neighborhood, helping to bring charging and a Ride and Drive to his workplace, receiving a city-wide proclamation declaring September 10th-16th Fort Collins Drive Electric Week and helping to grow EV Enthusiasm throughout his family. The Hatch family LEAF in front of their Solar PV system. 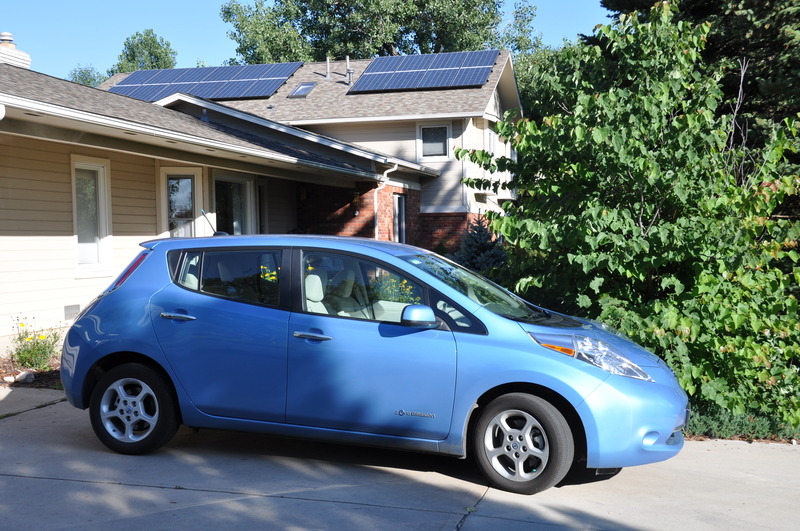 The Hatch Family got their Nissan LEAF in February 2014. Doug was the first in the family to want the LEAF, but his enthusiasm for driving electric soon spread through the family, to his wife, Joan and their four children. “After Joan drove the car, she fell in love with it too. She then told all of her friends that she bought it for me for Valentine’s Day,” Doug said jokingly. “My driver’s test went well. It was very short and quiet because the instructors aren’t really prone to make small talk, plus the car itself is so quiet. 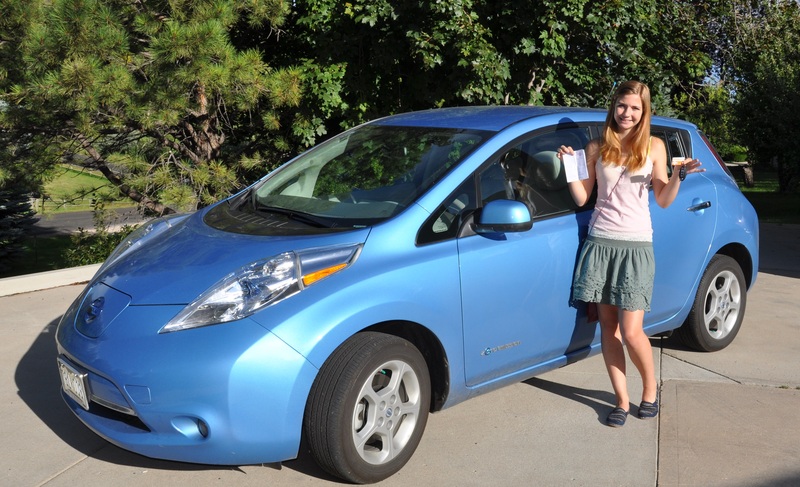 The LEAF drove as its normal, exceptional self,” Kelli explained. Her parents see the quiet driving experience as an added safety bonus for their daughter when she is behind the wheel. “The LEAF is a very safe car to drive. In addition to the car’s safety features, the controls and instrumentation are easy to understand and operate. The LEAF is also so quiet that we were confident Kelli could easily focus on verbal instructions and easily maneuver the car during her driving test,” said Doug. The Hatch family prefers their LEAF for a variety of reasons, and clearly, they understand the larger impact of driving electric. As Kelli put it, “I think driving electric is very important. Coal and other resources aren’t going to last forever, and people need to start looking at sustainable energy sources, such as the sun, wind, water, etc. Also, gas cars are contributing to the increase in levels of greenhouse gases and it needs to stop.” As Doug put it, “Kelli is a part of the next generation of drivers. She is very happy to be driving a zero emission vehicle that is easy to drive and inexpensive to operate. She and her peers regularly plug in and charge their music players and phones, so charging your car seems like a very natural thing to do!” And the results of Kelli’s driving test? According to Doug, “Kelli passed her driver’s test with flying colors. We are so proud of her! The driving inspector let us know that it was the first time she had given a driving test to anyone in an all-electric vehicle…. Go Electric!” In the EV world it is common for the majority of charging to occur either at the home or at the workplace. After installing a level II charging station at home, all Doug needed was access to charging at work. In April 2014 Doug’s workplace hosted one of the largest Ride and Drives in Northern Colorado to date, supercharging EV excitement throughout his workplace. A few months later, the office installed two level II charging stations, which are open to employees, allowing Doug and the growing number of his colleagues who own EVs to live the complete charging experience. To further exemplify the Hatch family enthusiasm for EVs, Doug represented DENC by receiving a proclamation from the mayor of Fort Collins declaring September 10th-16th Drive Electric Week in the city. Doug gave a short speech about Drive Electric Northern Colorado and his personal support for driving electric. Neighbors gathering around vehicles at the Hatch Family Ride and Drive. 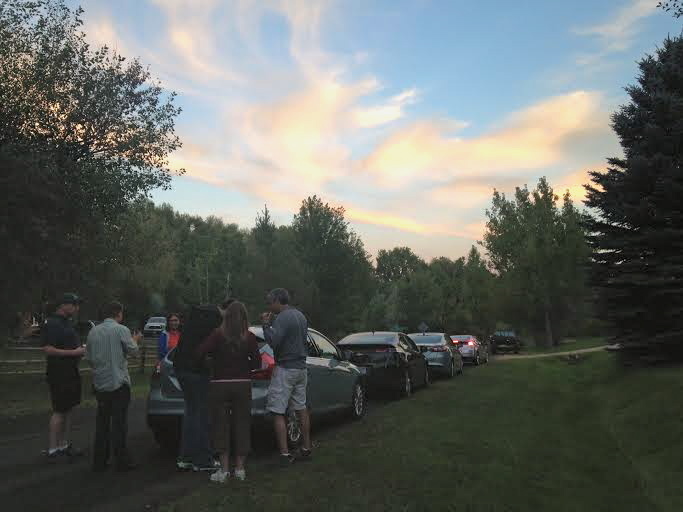 The Hatch’s also hosted an EV Ride and Drive at their home through the DENC Neighborhood Ride and Drive program, bringing a variety of EVs for their neighbors to learn about and test drive. The Hatch’s have solar PV panels on their home, so Doug was eager to educate guests on his “Sun powered LEAF,” or how his solar PV system charges his EV. “We just completed the solar PV upgrade to include another 10 panels. We now have 30 total,” said Doug. After roughly eight months of owning their EV, the enthusiasm continues to grow. “We have been thinking about a second EV to possibly replace Joan’s gas car,” said Doug. “We are looking at prices and considering future model improvements so it may take a little time to decide. Perhaps I would consider the Tesla Model X and let Joan drive the LEAF,” Doug joked.